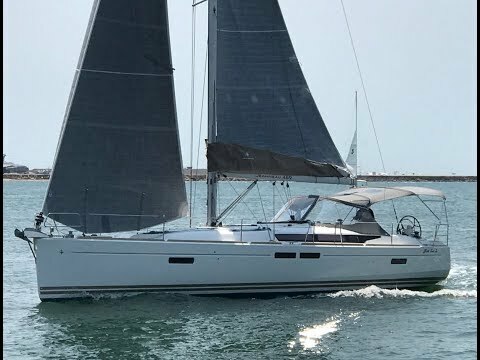 From the design cabinet of Philippe Briand, clean lines and an elongated hull with moderate freeboard give the Sun Odyssey 469 an extraordinary aesthetic value and performance.Bathed in light, the interior affords the volume and comfort typically found on a 50-foot sailboat. Aboard the Sun Odyssey 469, you will find many principal attributes of her inspiration and “big sister” model, the 509. North Sails 3Di exemplifies outstanding value with industry leading shape holding and a longer service life compared to other sailmaking technologies. Proprietary engineering and construction methods allow 3Di sails to maintain their shape to an unprecedented level. Superyachts now use one set of 3Di sails for racing, cruising, and deliveries. Volvo Ocean Race teams trust one mainsail for 35,000+ miles around the world; they formerly used two or three string laminate sails. Circumnavigators are using 3Di sails for multiple laps. Do the math, and you’ll find that 3Di sails have a lower cost of ownership than any other sails in the world. The Original Dacron Sails are also on the boat and are in like new condition.